I have already said that TV is a terrible teacher if you want to know how to be a good dad. It doesn’t set the delivery room expectations very well either. My wife didn’t yell that she hated me for doing this to her, she didn’t crush my hand in a painful yet comical way, she didn’t even demand drugs. Furthermore no one gave me hospital scrubs to wear. No one came in and took my baby to those baby viewing rooms. And at no point did I say, ‘Remember to breath honey heee heee whooo, hee hee whooo, hee hee whooo’. Maybe this has a lot to do with being a Canadian watching American TV. Someone from south of the border will have to tell me if they got to do all of these things, because I sure didn’t. Simeon’s birth beginning to end took 50ish hours. During that time we didn’t get a lot of sleep or eat a lot of proper meals. So when the doctor told me Meghan was 3cm dilated and that it would be another 10 hours before the baby would arrive I decided to eat. So off I ran and grabbed a quick hamburger and fries from McDonalds. Meghan went from 3cm to 10cm very quickly and started pushing within a few hours. The aforementioned smells mingled with the McDonalds in my stomach in a less than pleasant way. I managed to hold on long enough for Simeon to be born, for me to cut the cord, and hold him for a moment. After that I dashed out of the room and threw up. Which is I admit not the best reaction to meeting your first born. One of the neat things that a lot of mothers say about giving birth are the almost instant feelings of love and bonding with the new baby. After each of our children were born Meghan always looked exhausted but euphoric. When I first held Simeon that was my first experience with him that wasn’t mediated through Meghan or technology. I had a very surreal feeling of holding myself, but I was hardly experiencing the same euphoria that Meghan was. For many dads it takes time perhaps days, weeks or even months for those feelings of love and bonding to come. That is normal just give it time guys. Long gone are the days where husbands get to hang out in their favorite bar passing out cigars while their wives give birth. 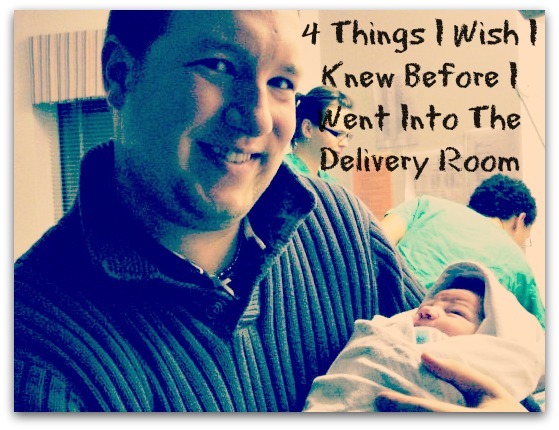 I knew I had to be in the delivery room, but I had no idea what I was in for. I don’t know what delivery rooms will look like when the students I talked with have their own children, but I sure hope they are more ready for the experience than I was. awesome blog! Im due tomorrow and sending this to my husband to read!! love your REAL-ness!! Congrats on your little one! Thank you very much, I hope this helps him to walk in feeling more prepared than I did! I’d be interested on hearing Dan’s perspective of this. He was an above-the-head kind of guy and I don’t think he got queasy – but what do I know? Men are given scrubs if they are going in for a c-section. I think like everything in parenthood, each person experiences these things differently. No woman’s labour is alike and probably no dad’s experience in the birthing room is alike. Oh I became an ‘above the head kind of guy’ pretty quickly which is why I managed to keep it together, but the damage was done. And you are very right, even within our own family each birth was very different from the others..
lol ….. by the third you knew where to be and what to expect mostly….Asher was in an unexpected hurry to see you!!!! I know each one put their own spin on coming into the world. Asher and Simeon were in a hurry by coming early compared to due dates, and Ariella and Asher were both quick labours.